FORT LEE, Va. – March is so full of savings that even the daylight is on the list. For commissary patrons, more daytime means a better view of opportunities to shop for significant discounts on frozen food, snacks and menu items for college basketball playoffs and more. College basketball fans can build their own meal bracket and fill their shopping basket with the commissary’s private label, Freedom’s Choice, for juices and ingredients for a slam-dunk fried rice recipe that goes with chips and dips for that tournament-viewing party. Patrons can also check out the Savings Center for more details and promotions. With March being National Nutrition Month, patrons can shop their commissary for plenty of nutritious choices, according to DeCA’s Health and Wellness Program Manager Deborah Harris, MPH, RD, CDE (Masters of Public Health, registered dietitian and certified diabetes educator). Harris added that meal planning is one of the best ways to stay on budget especially when there are recipe-specific promotions. Ingredients for the dietitian-approved “Thinking Outside the Box” recipes including classic American goulash and chicken farro, are on sale during the month of March. Patrons can learn more about the Nutrition Guide Program and Thinking Outside the Box recipes under the Healthy Living link located on the navigation bar of the DeCA website. “A full library of dietitian-approved recipes are available to help plan your meals, improve the nutritional quality of your diet, and get the most out of your commissary benefit,” Harris said. The agency reminds customers to visit its new online customer portal, MyCommissary, to manage their online shopping experience. The portal makes it easy to access their Commissary Rewards Card account, see the current sales flyer and place a CLICK2GO curbside pickup order at participating stores. March is also National Frozen Food Month, and your commissary is playing an up-tempo game of savings. Look for the basketball-themed displays in the frozen food aisles for more deals on your favorites. 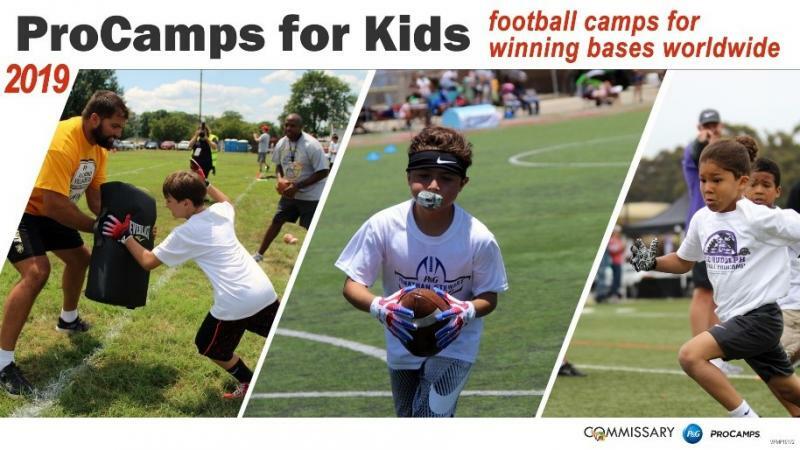 ProCamps for Kids Competition: Procter & Gamble, in collaboration with ProCamps, is sponsoring football camps for winning bases worldwide. Grand prize winners will receive a free military athletic camp on their installation for up to 150 participants (a value of $195/camper). Additionally, at least one commissary will win a seven-on-seven flag football camp for the installation community. Look for the P&G and ProCamps for Kids displays in your local commissary for details on how to enter and win. Indian Motorcycle Sweepstakes: One lucky commissary customer will ride home on a custom Full Throttle Indian® Scout® Bobber Motorcycle. Five first-place winners will also win a Full Throttle Toolbox Fridge. Look for the Full Throttle displays in your local commissary for details on how to enter and win. Event continues through March 31. Win a VIP Race Day Experience: Commissary shoppers can enter to win a chance to meet Smithfield #10 car driver Aric Almirola. This grand prize includes a three-day/two-night trip for two to the stock car race of their choice in the continental United States, hotel stay, spending cash, a personal meet-and-greet with Almirola and more. To enter for a chance to win, text “DECA” to short code 797979 using your SMS-enabled cellphone, along with a photo of your receipt from a commissary showing the purchase of any three or more Smithfield brand products in a single transaction during the sweepstakes period. In addition to the grand prize, 15 first-prize winners will each receive one $50 commissary gift card. Look for Smithfield displays at your local commissary. To participate and read the official rules, visit www.SmithfieldDeCASweeps.com. The sweepstakes run from March 4 to May 5. Unilever and its men’s grooming line are official partners of the 2019 NCAA Final Four event! Commissary customers have an opportunity to win over $25,000 during this promotion and a chance to enter and win one of 10 big screen 52” LED TVs in select stores. Look for the Unilever displays in your local commissary for details on how to enter and win. Event runs March 4-15.